the Holy Scapular of Carmel. 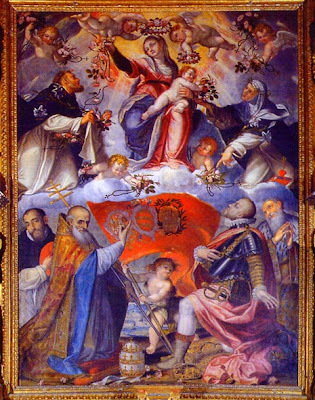 To that list we could add the Holy Rosary. One of the finest discussions of this question is given by Germain Grisez in his book, Living a Christian Life, Vol. 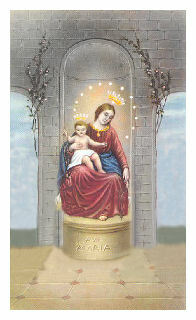 2 of his The Way of the Lord Jesus, pp. 721-737. In Love and Responsibility (1960) Karol Wojtyla has some helpful things to say, particularly in the final chapter on sexology. I will first summarize material from Grisez, then from Wojtyla, and finally offer some practical suggestions. 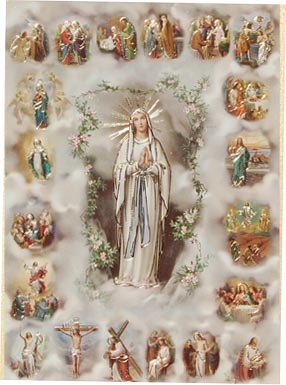 The penitent replied: “Father, how can you then distinguish what comes from the heart and is inspired by Our Lord, and that which instead is inspired by the devil?” “You will distinguish it,” replied the holy priest, “always by this: The spirit of God is a spirit of peace, and also in the case of grave sin, it makes us feel a tranquil sorrow, humble, confident, and this is due precisely to His mercy. 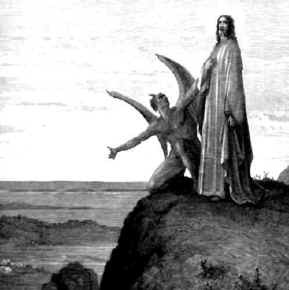 Demons, Satanism and other related phenomena are quite topical today, and they disturb a great part of our society. Our technological and industrialized world is filled with magicians, wizards, occultism, spiritualism, fortune tellers, spell trafficking, amulets, as well as very real Satanic sects. Chased away from the door, the devil has come in through the window. Chased away by the faith, he has returned by way of superstition. The episode of Jesus' temptations in the desert that is read on the First Sunday of Lent helps us to have some clarity on this subject. First of all, do demons exist? That is, does the word "demon" truly indicate some personal being with intelligence and will, or is it simply a symbol, a manner of speaking that refers to the sum of the world's moral evil, the collective unconscious, collective alienation, etc.? Many intellectuals do not believe in demons in the first sense. But it must be noted that many great writers, such as Goethe and Dostoyevsky, took Satan's existence very seriously. Baudelaire, who was certainly no angel, said that "the demon's greatest trick is to make people believe that he does not exist." Read the rest of the article by Father Raniero Cantalamessa, O.F.M. Cap. here. 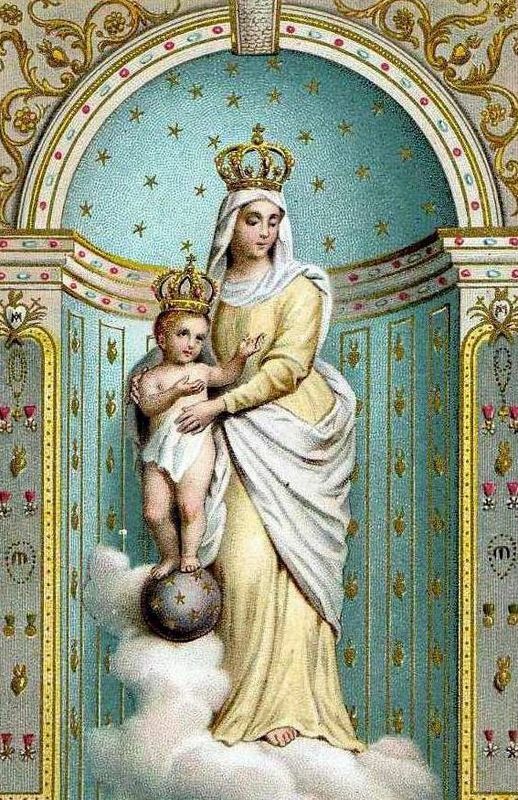 H/T today's meditation of the day, The Magnificat, October 2010. 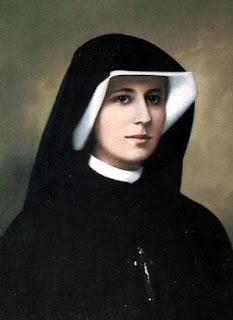 Sister Margherita is a Filippini Sister and is from New Jersey. I hope I am able to meet her in person one day. I did not know how funny and feisty she was! 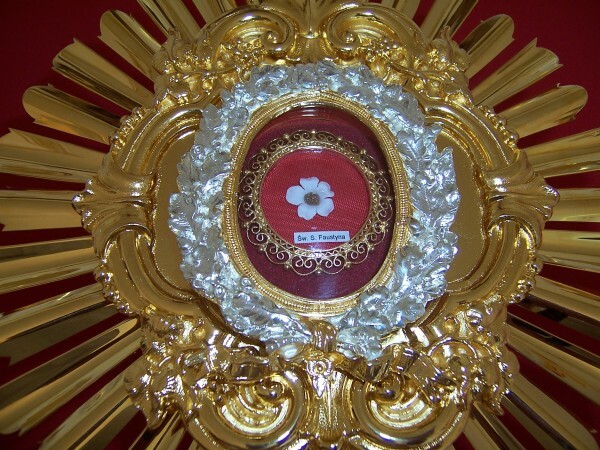 My mom who's parish has one of the Filippini Sister's convent, first introduced me to her cause. She has been one of my heroes for a long time because of her defense of Pope Pius XII. This was a great program! 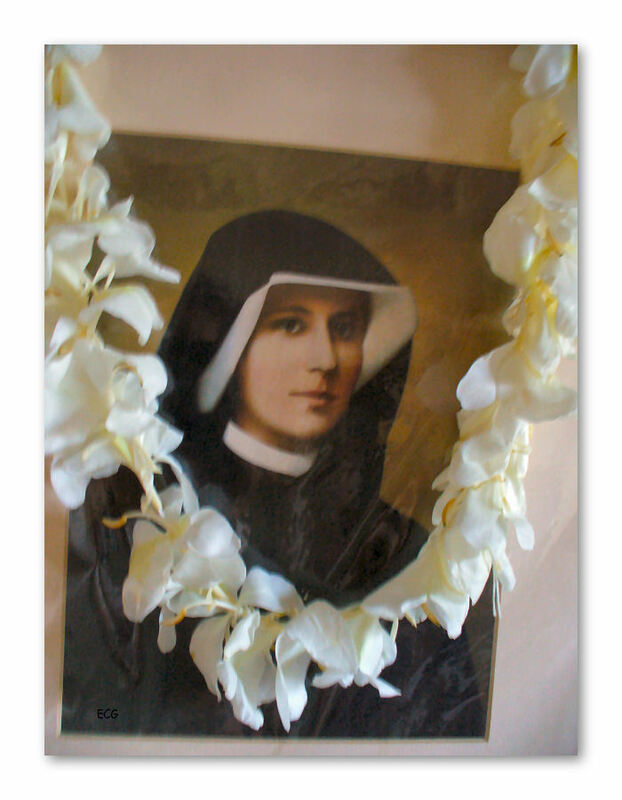 If you are ever in North Jersey, be sure to visit the Filippini Sister's Mother House in Morristown...the beautiful Villa Walsh. "...He whose soul has become a seat of consummate humility is not only able to confess his wrongs with ease, to submit himself or to bear an offense with resignation; he actually elects to be the last. He yearns for the practice of obedience; he is glad to suffer slights and is avid for contempt and rebuke. It is here that we reach the mysterious innermost core of Christian humility..."
- Humility - Wellspring of Virtue by Dietrich von Hildrebrand. Available through Sophia Press. 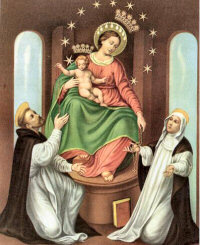 "It could be said that each mystery of the Rosary, carefully meditated, sheds light on the mystery of man. "Cast your burden on the Lord and he will sustain you" (Ps. 55:23). 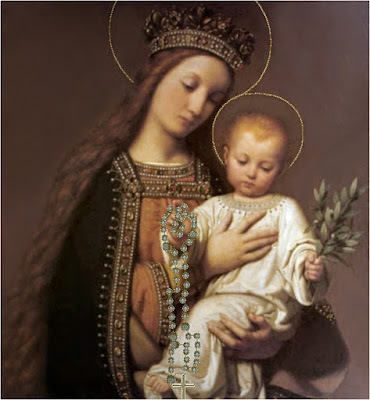 To pray the rosary is to hand over our burdens to the merciful hearts of Christ and his Mother. The rosary does indeed 'mark the rhythm of human life, bringing it into harmony with the 'rhythm' of God's own life, in the joyful communion of the Holy Trinity, our life's destiny and deepest longing. 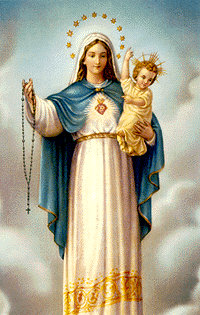 Through the rosary the faithful receive abundant grace, as though from the very hands of the Mother of the Redeemer." - Venerable John Paul II. "Modesty is the prudence of chastity. Ladies, be modest in your dress, in your words, in your behavior if you want to help men acquire and preserve the virtue of purity. You can be an angel or a devil to a man. He needs your help to stay in God's grace. It is very difficult for him to do this on his own power. Some day you will be held accountable for what has been expected of you. If you want the Lord's blessing, learn to be modest. Men do understand modesty. Finding God's Will for You available at Sophia Press. "He was a much sought after confessor. 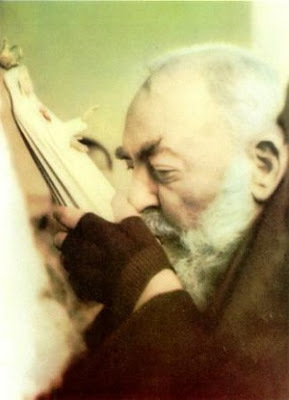 Many eyewitnesses testified that he always had a long line of penitents." 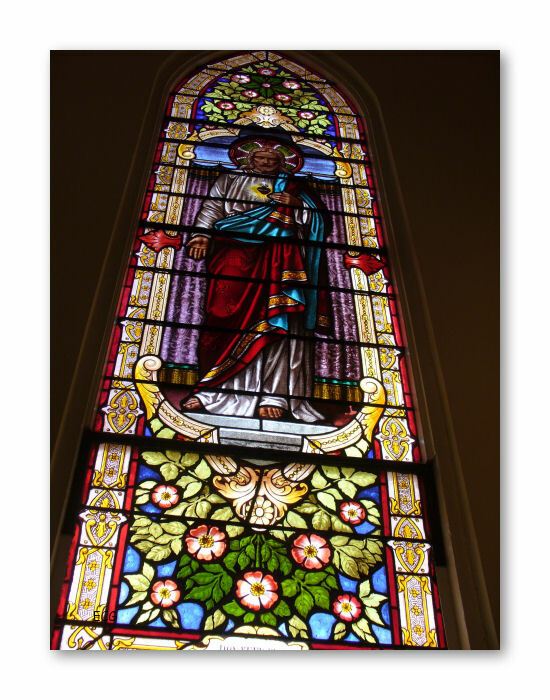 "The parishioners dearly loved him and all were full of praise for him. 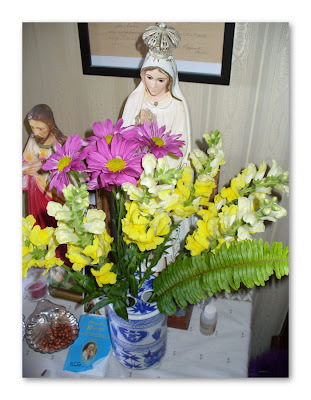 He seemed to celebrate Mass with greater devotion than others ordinarily manifested. 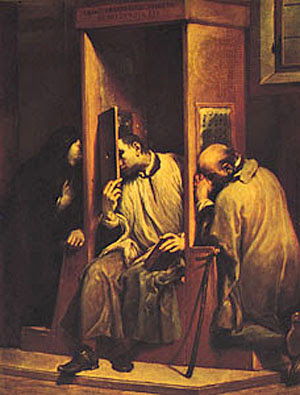 As a confessor I found him patient, affable and full of charity and I wanted to go to him to confession more than to others..."
"I heard everybody speaking of him as a very holy man." - Therese Eckstein, later a Sister of Charity. 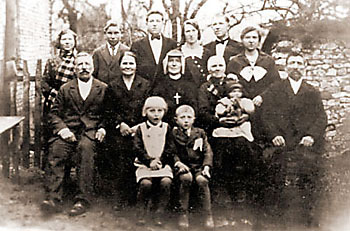 Father Seelos healed the husband of a devout Catholic woman. 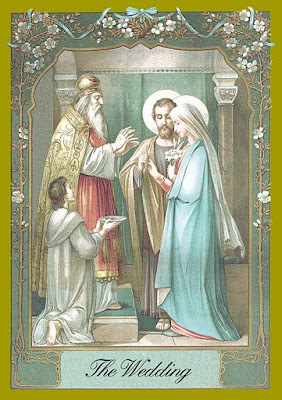 The husband was non-Catholic and ridiculed his wife's religion. The husband had a "suppurating ulcer" on his face. 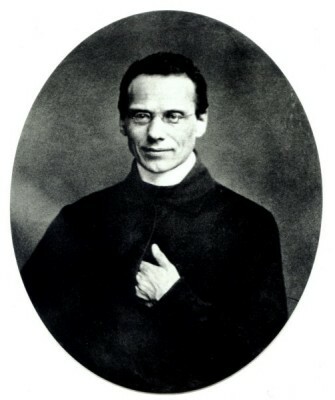 Father Seelos placed his hands on the man's face and prayed. The ulcer disappeared. 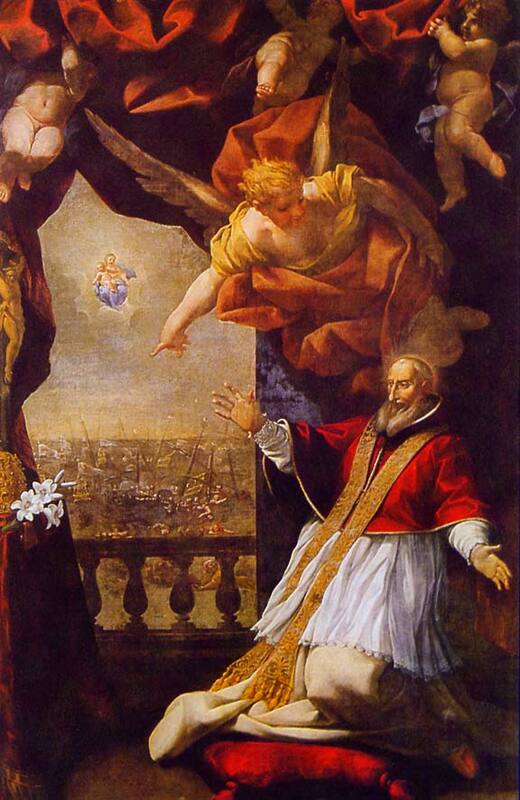 The man not only stopped ridiculing the Catholic Church but later converted. Father Seelos also healed an 11 year old girl from convulsions when no one else could help her. After his death, many miracles have been attributed to him, according to Bob and Penny Lord in the episode of Bl. 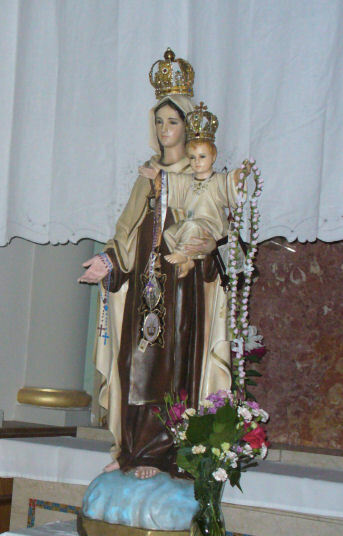 Seelos on Super Saints (which airs on EWTN. 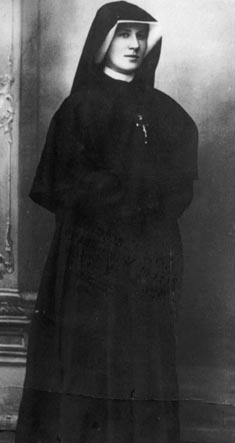 It seems that after Mother Angelica suffered a severe stroke in 2001, prayers for Blessed Seelos' intercession were offered. After Mother came out of surgery, the doctor declared that one person had survived that kind of brain surgery and that person was Mother Angelica! One night, our chihuahua puppy came down with a bad eye problem. The lower lid of his right eye was swollen and hanging down, appearing like a large red gel sac. We immediately took him to the pet emergency clinic. The vet did not give a very good prognosis: the eye could be lost. We prayed prayed to Fr. Seelos. His eye was saved, but he would have to take steroids & eyedrops to bring the swelling down. 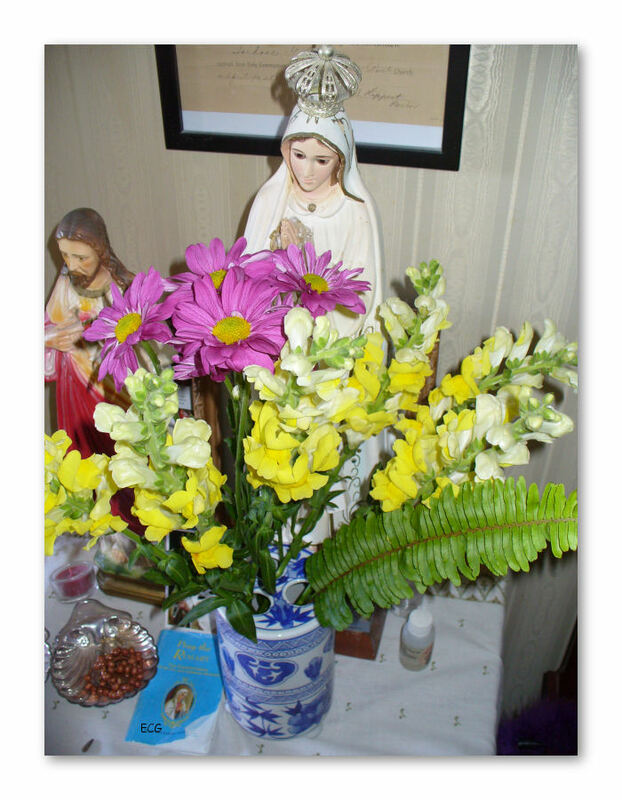 Having had bad reactions to medicines in the past, we begged Fr. Seelos to cure his eye by morning. The next morning his eye was completely normal. When the clinic called the next day for a check up, they were astounded that his eye was normal. 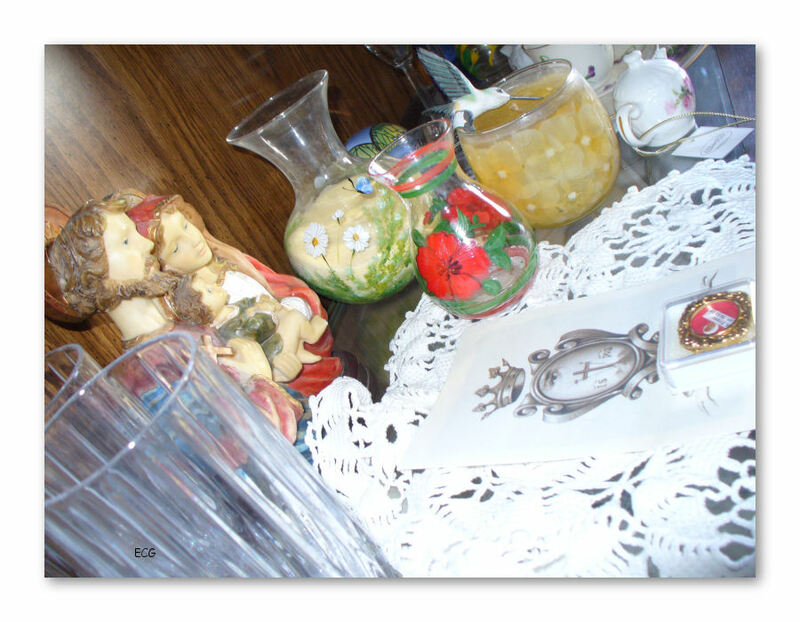 and had her post the request in the Seelos.org guestbook. Twenty minutes later the vet called the woman in, who shortly came back out crying, “It’s a miracle, he’s o.k.” Thanks to Fr. Seelos, there was no more sign of kidney failure. Quotes Source: Cheerful Ascetic: The Life of Francis Xavier Seelos, C.SS.R. by Mihael J. Curley, C.Ss.R. 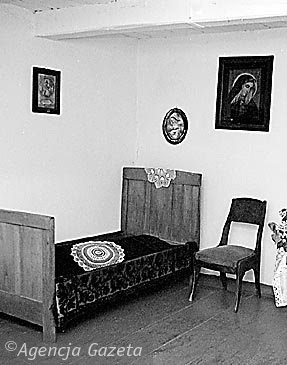 Room in Kowalska Home where Sister Faustina was born. 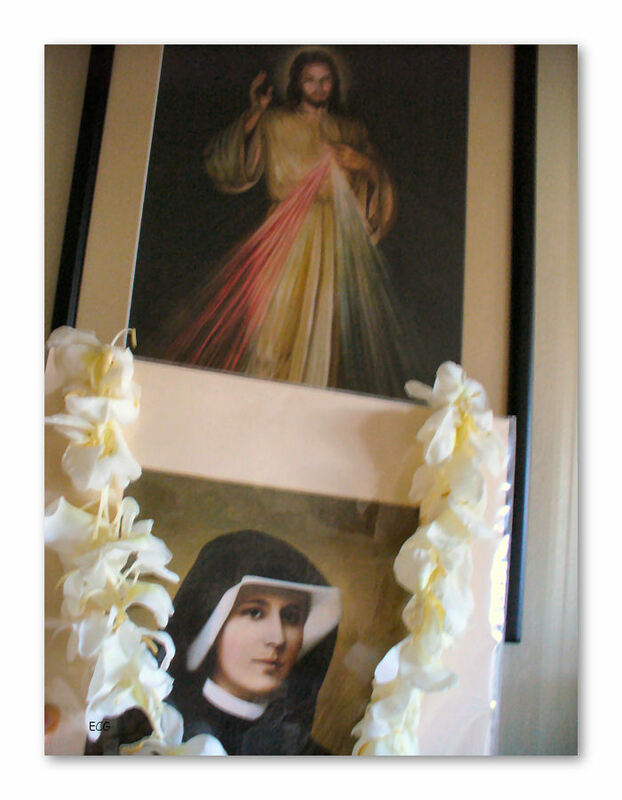 From Divine Mercy in My Soul: Diary of Sister M. Faustina Kowalska. Queen of the most holy Rosary, in these time of such brazen impiety, manifest thy power with the signs of thine ancient victories, and from thy throne, whence thou dost dispense pardon and graces, mercifully regard the Church of thy Son, His Vicar on earth, and every order of clergy and laity, who are sore oppressed in the mighty conflict. Do thou, who art the powerful vanquisher of all heresies, hasten the hour of mercy, even though the hour of God's justice is every day provoked by the countless sins of men. 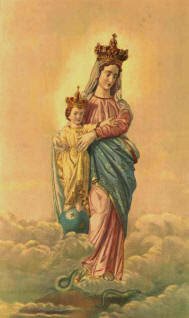 For me who arm the least of men, kneeling before thee in supplication, do thou obtain the grace I need to live righteously upon earth and to reign among the just in heaven, the while in company with all faithful Christians throughout the world, I salute thee and acclaim thee as Queen of the most holy Rosary. 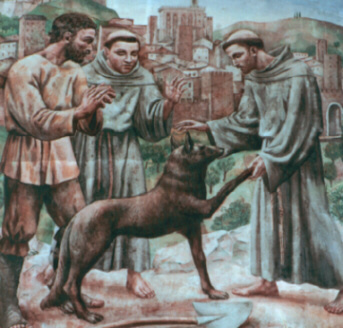 The Feast of St. Francis of Assisi (Oct. 4)always reminds us about the emotional value of our pets. Is there any theology involved? 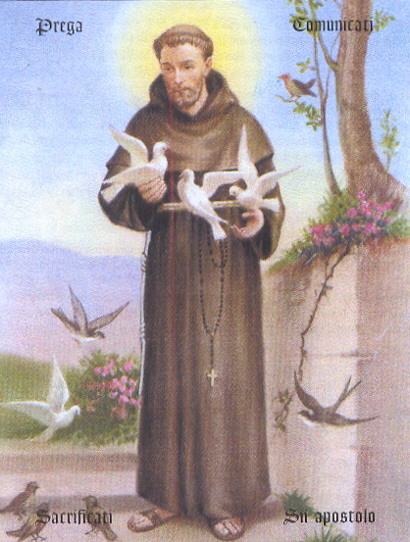 St. Francis reminds us that animals are of God’s creation. They don’t have a soul or a spirit as we do, but they are of God’s creation. That’s why Francis talks about Brother Sun and Sister Moon. He found the wisdom and the creativity of God in all creatures. He believed that as we get to know God’s creative work and become friends with and close to God’s creative work, we also come to know the Creator. God can speak to us in many different ways, even through the simplicity and the dependency of an animal, so we ask God to bless them. Whatever the pet is – a dog, cat, bird, fish or even a snake – it gives us an opportunity to see God’s creation, to think beyond ourselves. It’s kind of amazing that pets can teach us to be more sensitive to human beings. In their great need, they show us how to be attentive to others. For the most part, they offer us unconditional love and presence. Thanks Mary Jane for sharing! "If thou wilt be perfect go and sell that thou hast and give to the poor and follow Me...."Take nothing for your journey, neither staves nor scrip, neither shoes nor money. "...If any man will come after Me, let him take up his cross and follow Me." 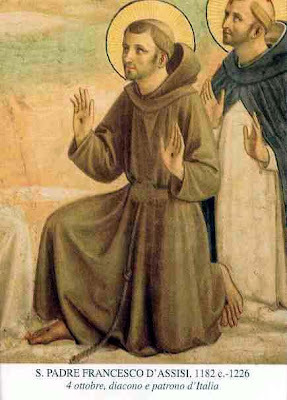 Then said St. Francis to Bernard, "Behold the counsel that Christ giveth us. Go, therefore, do faithfully what thou has heard, and blessed the name of our Lord Jesus Christ, who hath deigned to reveal to us the life evangelical." 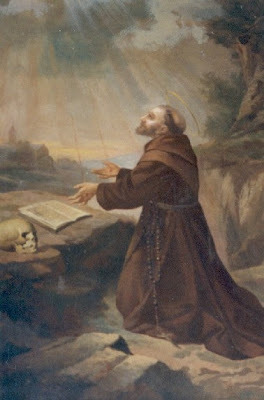 - from the Little Flowers of St. Francis of Assisi Chapter Two: Of Friar Bernard Quintavalle, the First Companion of St. Francis, and How He Came to Forsake the World to Follow Him. And Likewise How Silvester Forsook the World. "O poor little one, wherefore art thou troubled? Ought a man to forsake God for His creature? When thou didst call, Friar Bernard was united with Me, and therefore could neither come to thee nor answer thee. Marvel thou not if he could not respond, for he was so lifted out of himself that of thy words he heard none..." Francis to Brother Bernard: "I command thee by holy obedience that, in order to punish the arrogance and rashness of my heart, though shalt now, even as I lay me supine on the ground, set one foot on my neck and the other on my moth and so pass thrice from one side to the other, reviling and crying shame on me; and especially shalt thou say, "Lie there, churl, son of Peter Bernadone! whence cometh such pride to thee, though that art so vile a creature?"... 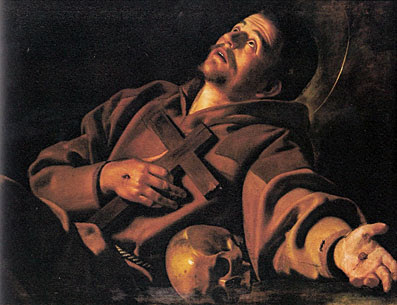 - Chapter Three: How St. Francis, by Reason of an Evil Thought he Had Cherished Against Friar Bernard, Commanded the said Friar that he Should Treat on his Neck and Mouth. 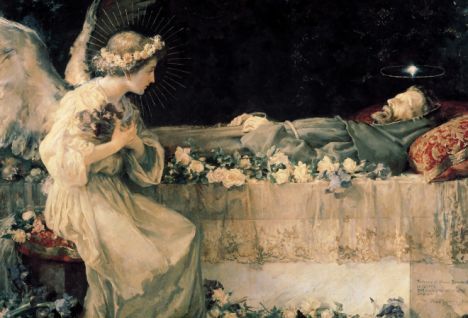 "O good youth, prithee give them to me, lest birds so gentle, that chaste, humble, and faithful souls are compared to them in the scriptures, fall into the hands of cruel men who would kill them."... "O my little sisters, ye simple doves, innocent and chaste, wherefore suffer yourselves to be caught? Now will I rescue you from death, and make nests for you, that ye may be fruitful and multiply, according to the commandments of our Creator." - from Chapter Twenty-two: How St. Francis Tamed the Wild Turtle Doves, and Took into the Friary the Youth Who had Snared them but Had Given them Over. 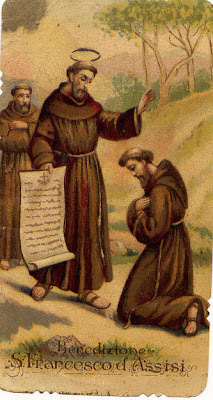 ..."Come hither friar wolf; I command thee in the name of Christ that thou do hurt neither to me nor to any man."... 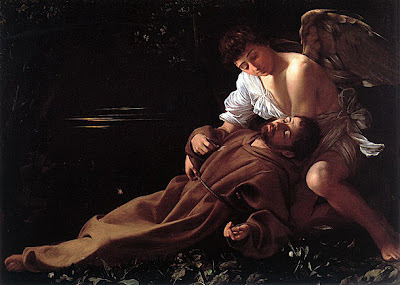 - from Chapter Twenty-one: Of The Most Holy Miracle that St. Francis Wrought When He Converted the Fierce Wolf of Gubbio. 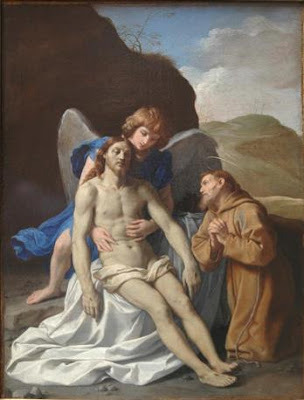 ...for when St. Francis came to die, after the manner of the holy patriarch Jacob, with his devout children standing around him, all sorrowing and weeping at the departure of so loving a father, he asked, "Where is my first-born? Come nigh to me, my son, that my soul may bless thee ere I die." 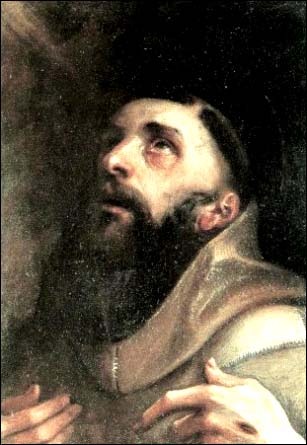 Then Friar Bernard said secretly to Friar Elias, that was vicar of the Order, "Father, go to the right hand of the saint that he may bless thee." And Friar Elias drew nigh to his right hand, and St. Francis, that had lost his sight through excess of weeping, placed his right hand on Friar Elias' head, and said to Friar Bernard, "God the Father and our Lord Jesus Christ bless thee with all spiritual and celestial blessings. Thou are the first born, chosen in this holy Order to give evangelical example, and to follow Christ in evangelical poverty, for not only gavest thou thine own substance and didst distribute it wholly and freely to the poor for love of Christ, but though didst offer thyself as to God in this Order, a sacrifice of sweetness. Blessed be thou therefore by our Lord Jesus Christ and by me, poor little in, His servant, with blessings everlasting, walking and standing, watching and sleeping, living and dying. Let him that blesseth thee be filled with blessings, and he who curseth thee go not unpunished. 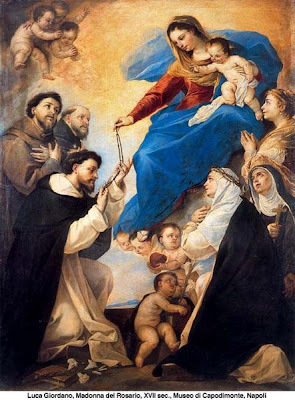 Be thou lord over thy brethren and let all the friars obey thy commands, whosoever thou wilt, let him be received into this Order; let no friar have lordship over thee, and be it lawful to thee to go and to abide wheresoever it may please thee." - Chapter Six: How St. Francis Blessed the Holy Friar Bernard and Appointed him to be his Vicar on Earth When that he should Pass from this Life. Excerpts from the Little Flowers of Saint Francis of Assisi, The Peter Pauper Press, Mount Vernon.